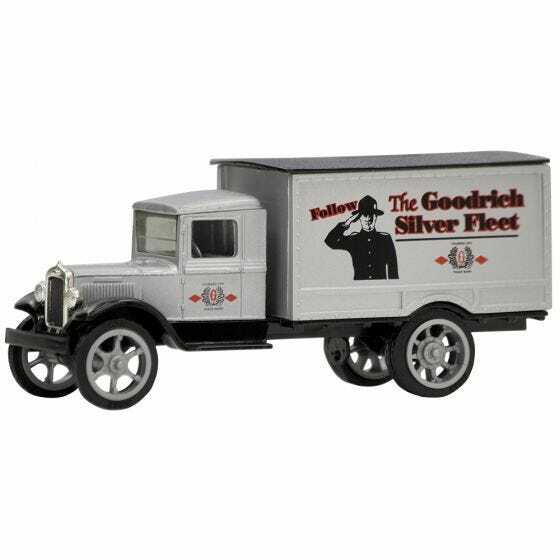 This cool and collectible B.F. Goodrich diecast truck is also a penny bank. 1931 Hawkeye Truck Bank The Hawkeye Truck Company of Souix City, Iowa, started business in 1916 manufacturing the Hawkeye Motor Truck. Models ranged in size from 1 ton to 3 1/2 tons with a 4 or 6 cylinder Buda or Wisconsin Engine. With the exception of the hood, the earlier models were made of wood and the running gear was purchased, but the gram and other component parts were built in the Sioux City Facility. This great American truck was produced until the company closed in 1933 as a casualty of The Great Depression. Diecast Trucks make excellent gifts for collectors, enthusiasts and youth. WARNING: Choking Hazard-Small parts. Recommended for ages 10 and over. what is the size of the goodrich silver fleet truck bank? The truck is 7 1/4" long, 3 1/4" tall at the box/bank section, and the bank section is 2 1/2" wide.